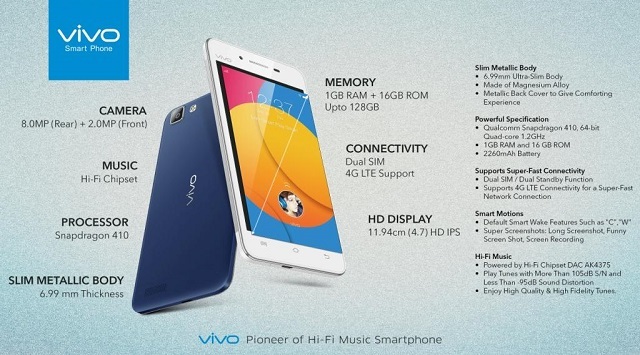 With the increasing demand for affordable smartphones in India, Vivo has now launched the Vivo Y27L in the country. Vivo has announced the launch of its new Y series focused at the price-conscious consumers. The Vivo Y27L, which is the premium model in the series, has a 4.7 inch IPS display with resolution of 1280 x 720 pixels. The smartphone is powered by a quad core Snapdragon 410 processor with 1 GB of RAM and 16 GB of internal storage and 4G connectivity. The Vivo Y27L has an 8 MP rear facing auto focus camera with LED flash. There is also a front facing 2 MP camera. The device runs on the Funtouch 2.0 OS with a 2260 mAh battery. The handset is priced at Rs. 12980 and comes bundled with one year extended warranty.